Give flowers with a purpose for the gift of a beautiful pause: time for a little self care and relaxation. The bath truffle bouquet contains half dozen roses. Two rose bath melts of each of three scents: true love (red), sweet heart (pink), and honey bunches (ivory). 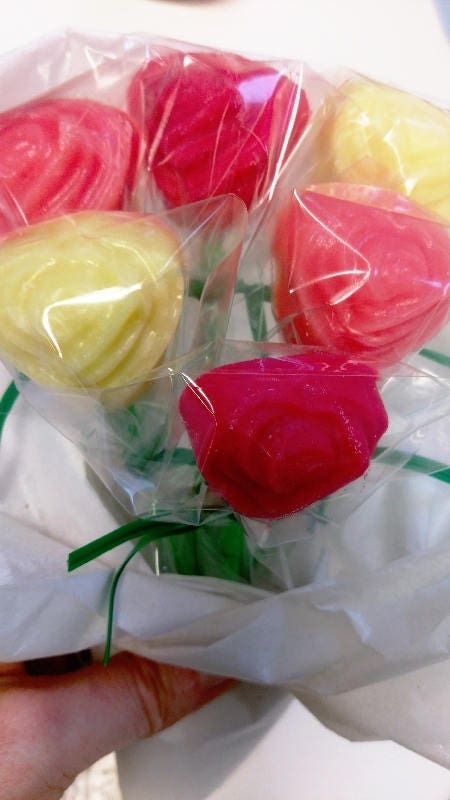 Each rose is made of cocoa butter, sodium bicarbonate, citric acid, fragrance, and mica. The true love also has geranium essential oil. Dissolve one to two roses in a warm bath. The cocoa butter will melt and create a luxurious, silky, moisturizing bath experience with a lovely fragrance. She'll be delighted! Each bath truffle weighs 1/2 ounce. Total weight of bouquet is 3 oz.